This morning I was reading blog posts on my ipad and drinking coffee. I read Liz' post at Quirky Vistas and Vickie's at Ranger 911, featuring their fun garage sale finds, when all of a sudden I realized it was Friday. I was off work. I could go to the garage sales. It was already close to 8 am, actually sort of late for a true garage saler. But, a couple of sales sounded interesting, garage items and man metal junk (for my gardens of course), and an estate sale. Off I went. 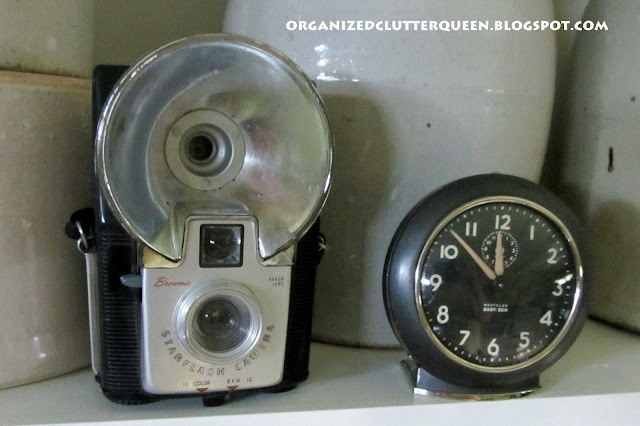 I picked up this Brownie camera for $1.50 and this Baby Ben clock for $1.00 this morning. I like to collect items that I remember from my childhood era. I have wanted one (or more) of these wind up clocks ever since I saw Angie's Knick of Time Interiors header. I found some great stuff great garden stuff too. I spent less than $10. I am happy. Or am I? In the back of my mind, I can't shake this feeling that the "minimalist forces" are slowly taking over. Bone china teacups and figurines, silverplate, crystal, all the "pretties", are getting much easier to find AND at reasonable prices. Is demand declining? I think so. And how about vintage kitchen utensils? Readily available, and very cheap. I guess they might scream "Country Kitchen", heaven forbid. Oh well, I guess all the more for me, because I will never go "contemporary"! I'm not afraid to be "outdated" and "out of style". What do you think? Is contemporary slowly taking over? Good subject. I feel that alot of vintage is getting harder to find because of the vintage craze. Like the cameras (what a steal on that), globes, signs, etc. It may just be where I am shopping or not looking hard enough. But the glassware and kitchen items that are in plenty, one would think it is because of all the downsizing. I for one did alot of that 2 years ago. I will never be modern. But I am the only one in my family that is vintage and cottage. My kids are all contemporary. I guess we just have to be comfortable in our own style and be COZY. Every look needs a little updating from time to time! Not at all! I never liked mid century modern until our oldest daughter started picking up a few of those things, some modern "new" items and mixing them with the really old stuff. It's not what I have in my house, but I like it in hers. As long as you love your pieces, you are going to be happy with your home, right? And I have that same clock! It's one of my favorites. And the price of old clocks is skyrocketing, so you got a super duper deal!!! I will never be a minimalist nor will I ever go contemporary so if everyone else is going contemporary that leaves the good stuff for us!!!!! YAY!!!!! That little vintage camera is adorable... GREAT DEAL! For me....I think after so many years, I am just tired of antiques and all my clutter (depression). I am ready to simplify. Perhaps that is what others are doing. But that's a bonus for you because you can get all this cool stuff at a good price.